We walk regularly on land and think that it is fixed and does not move. But in reality, the land on which we walk also move. Then why we can’t feel its movement? It is because the movement of the land is so slow that we can’t notice. It only moves a few centimeters each year and takes millions of years to cover a significant distance. This movement of the land on our Earth is described by a theory called plate tectonics. There are four main layers of the Earth according to their different properties. These layers are the crust, mantle, liquid core, and solid core. We walk on the crust layer which is solid and floats on the mantle layer. But the movement of this solid surface happens in the crust and the upper part of mantle. 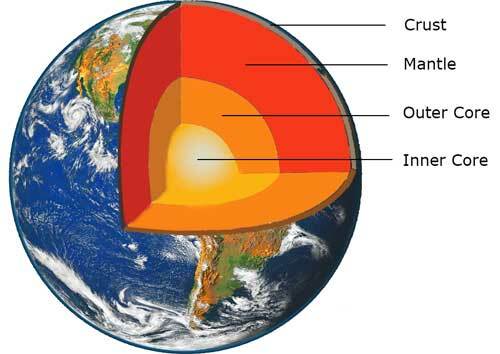 The crust and upper mantle part together constitute a layer called lithosphere. Lithosphere is the layer that moves but it is not in a single piece. There are several pieces of lithosphere that are connected together like a jigsaw puzzle. These pieces of lithosphere are called tectonic plates and they move on their own direction. There are a total of seven major tectonic plates that are much larger, and many smaller plates called minor tectonic plates. These all plates together constitute the surface of the Earth that moves. So, how these tectonic plates stay floating on the surface? The reason behind their floatation lies in the composition of rocks. The rocks which make the lithosphere are less dense than the liquid rock of the mantle layer. This density difference in the rocks makes the tectonic plates afloat and keep them from sinking. Have you watched the boiling water in a pan? If yes, then you may have noticed that the bubbling water from the bottom of pan comes to the surface. Whereas, the surface water goes back to the bottom. This effect is called convection and it is the main driving force behind the movement of tectonic plates. 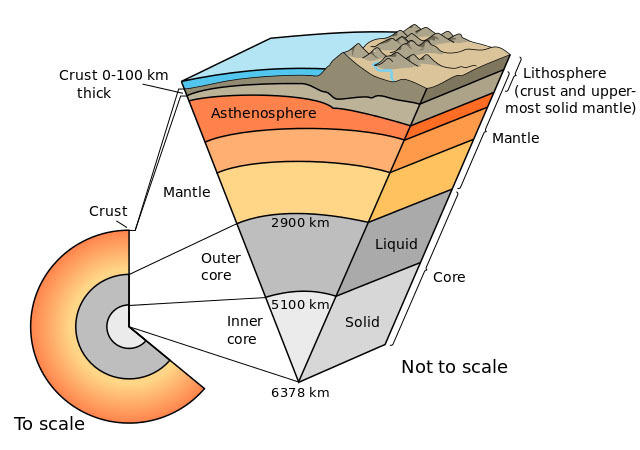 In mantle layers, the hotter rock near the core rises upward and colder rock sink to the bottom. These convective currents move the tectonic plates by pushing, spreading, and pulling them. The average thickness of tectonic plates in lithosphere is around 100 kilometers. The thickness of tectonic plates varies from one type to other and in the different region of the Earth. Tectonic plates have been divided into two main types according to their composition. Oceanic Plates: These plates are made of oceanic crust which is mostly composed of magnesium and silicon minerals. Continental Plates: These plates are made of continental crust which is mostly composed of aluminum and silicon minerals. The movement of tectonic plates is very apparent at their boundaries. The plates form various geological features as they move past each other. There are three types of boundaries according to the way the tectonic plates interact with each other. Transform boundaries: These boundaries occur between the plates which move past each other by sliding. In these boundaries, plates get almost no damage and location, where these boundaries occur, are called faults. Most often earthquakes are caused by sudden release of pressure at these boundaries. Divergent boundaries: In these boundaries, plates slide apart from each other and move in the opposite Most of the time these boundaries occur in seafloors and the result of these boundaries is the formation of the new seafloor. Because, as these plates move apart from each other, magma from the mantle layer reaches the surface and cools down due to ocean water. Convergent boundaries: When two tectonic plates push against each other, they form a convergent Sometimes when plates push against each other, one plate may go underneath another plate. Many volcanoes and mountains are also formed at convergent boundaries. Mariana Trench, the deepest place on the Earth, is the result of a convergent boundary between the Pacific Plate and Mariana Plate. The Pacific Plate moves underneath the Mariana Plate. Development of very accurate GPS allows scientists to track the movement of tectonic plates precisely. Himalaya mountain range is the result of a convergent boundary between Eurasian Plate and Indian Plate. 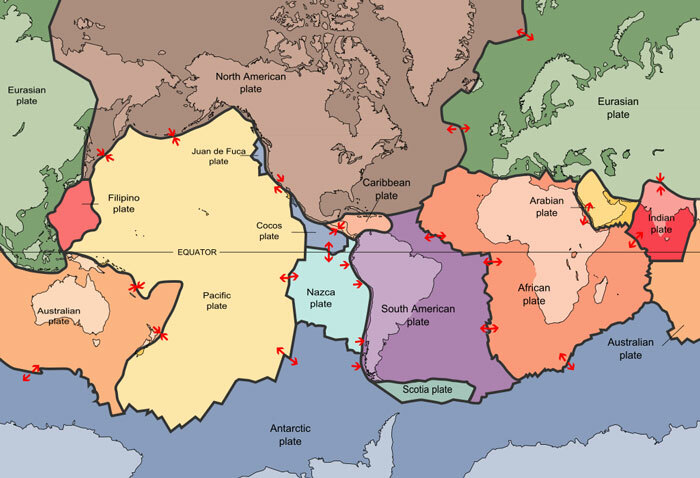 Abdul Wahab, "Plate Tectonics," in Science4Fun, April 12, 2019, http://science4fun.info/plate-tectonics/.